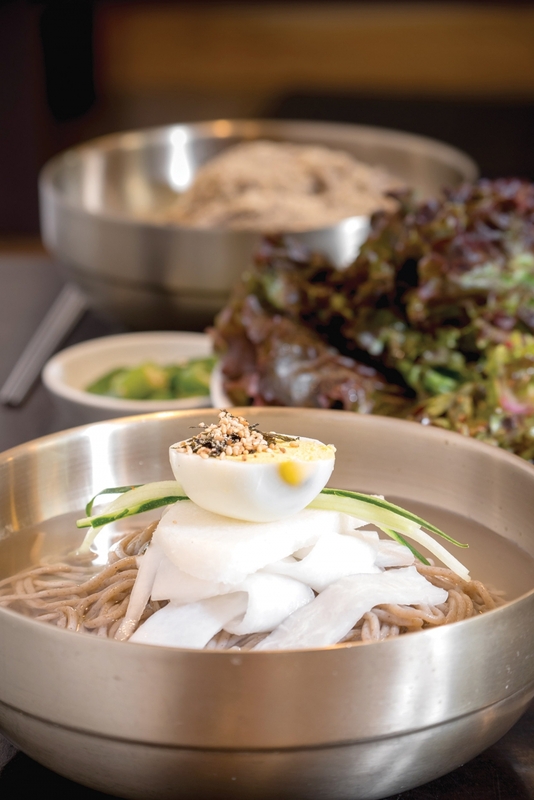 There’s more than just buckwheat flavoring the noodles at Namgyeong Makguksu. Love is in the air: Love for Korean tradition, for a Pyeongchang grandmother, for a wife, the texture and chew and smell of the humble makguksu noodle, and for the ingredients that best enhance it. 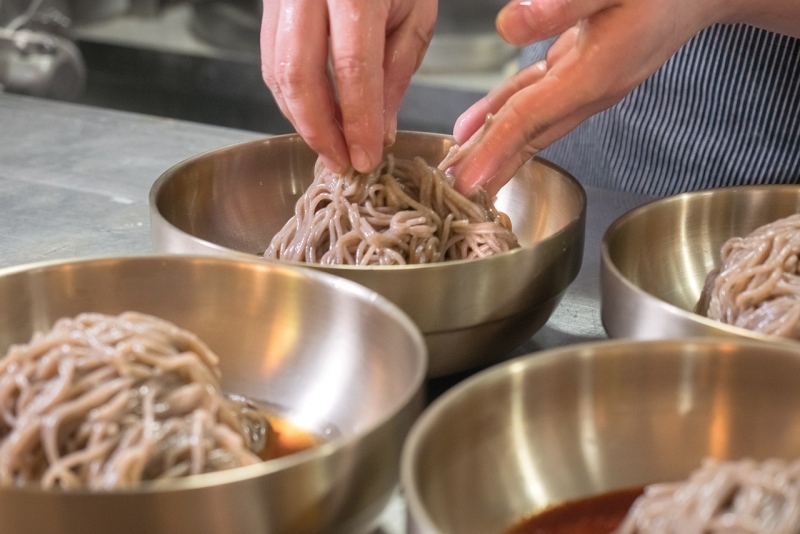 Chef Lim Soo Ho is a man brimming over with love for his noodles, his customers, and his life. Most people would have taken up a hobby. 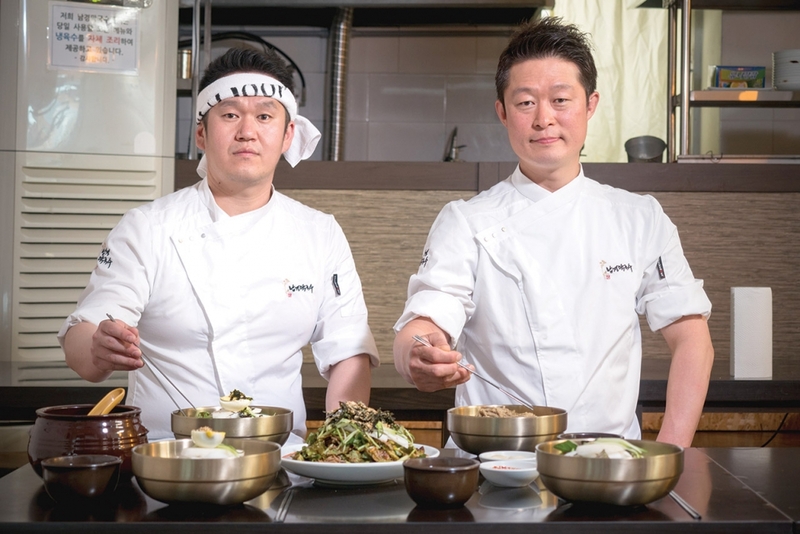 Chef Lim quit his job, gave up the life he’d built, and told everyone he was moving back to his hometown of Pyeongchang in Gangwon-do to learn how to cook — no matter what anyone else thought of his plans. Lim’s first venture into noodle making went better than anyone could have hoped. All the people who questioned his ambitions ate their words as he found a space and started working his magic with buckwheat. But after being in business for a while, Chef Lim started to doubt his skills. People started to say that the flavors weren’t quite there, and maybe the quality was declining because Lim was getting bored with his venture. If any noodles are capable of bestowing strength and happiness, it’s Lim’s makguksu. His buckwheat noodles manage the magic feat of being simultaneously chewy and tender, whether served in a thick, spicy sauce or in a clean, refreshing broth with gentle sourness. For real aficionados of the nutty, savory noodles, he also serves a sauceless version, and another topped only with ground wild perilla seeds, which turns it into a dish simultaneously rich and austere. The restaurant brought Lim more than just the satisfaction of running a business that makes him happy. It brought him love.